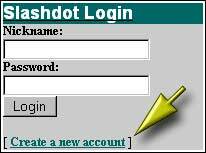 SlashDot - Did You Miss the Point? "Yeah, I've seen it. So?" It took me two, long false starts before I saw the value of SlashDot after hearing about it, and then another couple of months or so before I actually felt like I was participating, and then almost a year before I stumbled onto many of SlashDot's hidden gems. SlashDot works like this: users submit articles, editors filter those articles and post them on the site, readers read the articles and then comment on them and also on other user comments. Guess what: the high value content is rarely in the article, but is burried in the submitted comments. So if you've been going to SlashDot to get the news, you're missing out on 90% of the good stuff. If you immediately start browsing stories, you'll see that in addition to the article, there's a ton of user comments. So many, in fact, that this is what many first-time SlashDot readers give up and move on. Don't make that mistake. SlashDot allows users to post anonymously, and since there isn't any accountability, an awful lot of junk gets posted. In addition to submitting stories, users of SlashDot can also vote on whether a comment is relevant and worthy of others' time, or whether it should be skipped. Comments get ranked from -1 (trash) to 5 (really spiffy). This is called moderation, and you can do it too, if you have an account. Users that sign in get all kinds of wonderful features, in addition to site customization such as selecting which featurettes you want. Accounts are free, so get one if you don't have one. You can even keep a journal. When you post with a registered account, instead of as an anonyous coward, your comments start at a slightly higher rank. Of interest, comments that reach a ranking of four or higher will get saved forever, while the rest fade away with time. Of almost immediate interest is that with an account you can now set and save your personal tolerance threshold for casual browsing. I recommend a value of 4 or 5 to get a decent squelch of content to noise. To moderate, one must show some level of activity that demonstrates you're actually wading through content rather than have others do it for you. The catch, of course, is that you can't moderate in an article that you've written comments for. Every once in a while when you it an interesting article, drop your threshold level down to 0 (or even -1) and read some user comments. Additionally, don't be afraid to reply to people's comments or initiate your own line of thought. When people give your contributions a positive rating, your karma rating goes up. When your karma goes up, you get to moderate more. When SlashDot sees this patten of behavior over a period of time, it will eventually dish you out five moderation tokens. They are on a use-or-lose scheme and will expire in a number of days. As you're reading, you'll be given the option to rate a stories as you read them. You only get to rate five, use your power wisely. Once your moderation tokens are used up, you'll get some more later, if you keep up the level of activity as before. Another thing to be on the lookout for is these little buttons that follow a user's identification. Click it. This allows you to rank this person as a friend (and you become their fan) or foe (and you become their freak). Be sure to fill out your profile information, too. And with that, you've now got a presence established on SlashDot where you can keep up on the latest news without being swamped in pointless chatter.